How has your week been? Mine has been great aside from the down pouring rain we had yesterday ALL day! I also spent way to many hours at the dentist yesterday so when I got home, I decided that it was time for me to make the Feta-Filled Arepas we had been talking about for a while now. They are like comfort food you know? Very easy to make. We tried them last night and they were absolutely delicious especially because you are pretty much making an Arepa sandwich. 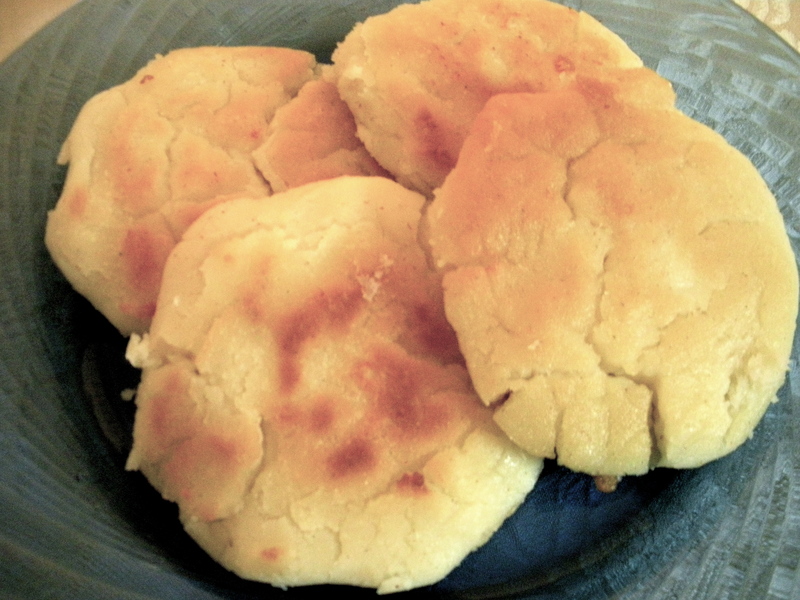 I had never tried of making Arepas any differently than how my mom makes them and adding baking soda and oil to the dough made a huge difference in their texture and taste. I got this recipe from the January 2010 edition of Food & Wine, my aunt gets that magazine and last time I was at her house I brought 2 back with me and took out all the interesting recipes that I plan on trying out for our blog. This recipe was created by Peter Berley and published in his most recent cook book Fresh Food Fast (http://www.foodandwine.com/recipes/feta-filled-arepas). In a large bowl, mix the masa harina with the baking powder, 1/2 cup of vegetable oil and 3 cups of cool water. Knead the dough several times, then wrap it in plastic and let stand for 15 minutes. Divide the dough into 16 pieces and flatten each into a 3-inch disk. Sprinkle the feta cheese over 8 of the disks. Top with the remaining disks and press the edges to seal. Gently press the arepas into even patties. Heat 1/4 inch of oil in 2 large skillets. Add the arepas and cook over moderately high heat, turning once, until golden, 6 to 7 minutes. Drain on paper towels, then serve. Mati, I hope you can find masa harina or have the Mr.’s parents send you some…. Have a wonderful day! * For our readers, you can google masa harina and even buy it online or maybe at one of your local super markets in areas with a lot of Latin Americans. The Goya brand carries masa harina also known as Corn Flour.